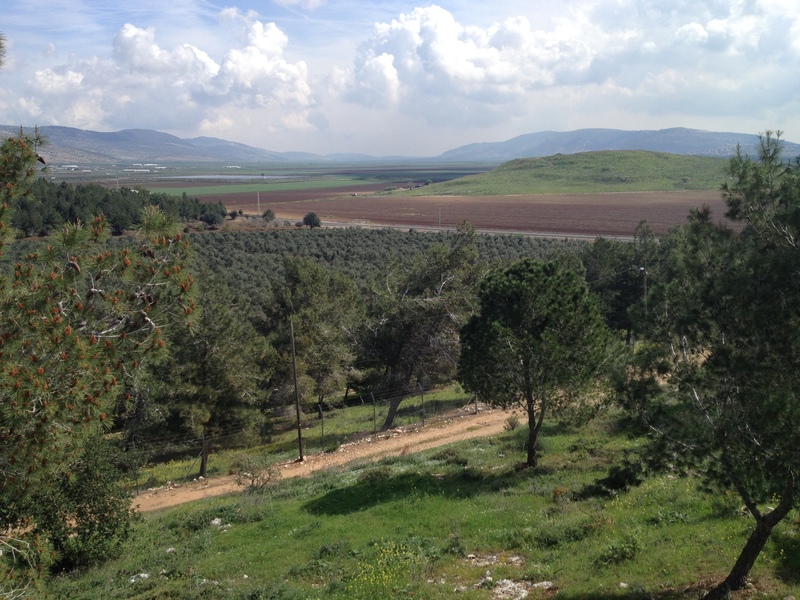 Looking out my front porch, I enjoy oaks and pines, vast olive groves, a beautiful Beit Netofah valley floor checkered with shades of green and brown agricultural fields, two mountain ranges dotted with Bedouin villages and a small, green hill in the middle of it all. In Israel, however, one can never make assumptions or think that something seemingly benign can’t have deep, historical meaning. Like this green hill. Right outside my window. The insignificant one. 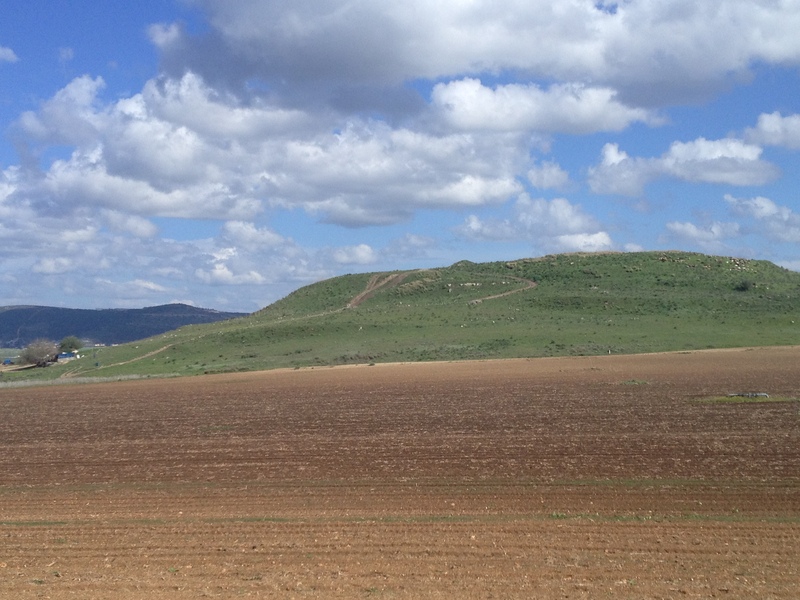 Tel Hannaton may seem like a nothing hill, but the history of this artificial mound (tel) goes back over 3500 years! It happens to be located at an important crossroad; on the Via Maris, the ancient road leading from Mesopotamia to Egypt, and on the road from Damascus to Akko, an important port on the Mediterranean Sea. Thus speaks Burnaburiash King of Babylon, your brother. and I spoke thus: Like our fathers, who were friends, we will be friends. And now, my merchants who traveled with Ahutabu delayed in Canaan for business. sent their men there. They beat my merchants and stole their money. Ahutabu , whom I sent to you, is before you. Ask him and he will tell you. Canaan is your country and its kings are your slaves, in your country I was robbed. Bind them and return the money they robbed. And the men who murdered my slaves, kill them and avenge their blood. my caravans and even my ambassadors, and the ambassadors between us will cease. If this should happen the people of the land will leave you. It is mentioned in the Bible (book of Joshua 19:14) , as being the northern border of the lands of the tribe of Zebulon. 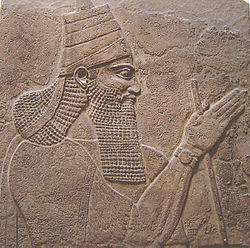 Our dear friend Tiglath Pileser III(732 b.c.e), King of Assyria, carved the stories of his victorious military campaigns on the walls of his grand palace in Nineveh and boasted that he conquered and plundered five Canaanite cities, the fifth one being… you guessed it, Hannaton! 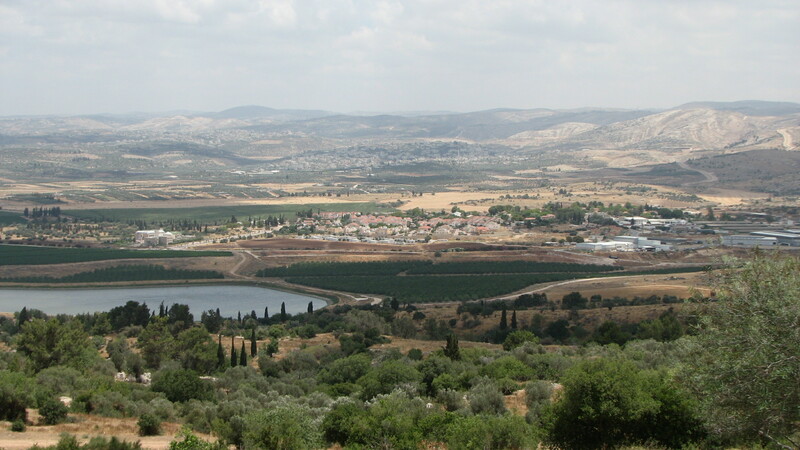 The Crusaders built an agricultural farm at Hannaton in the 13th century, during their 2nd Kingdom of Jerusalem. 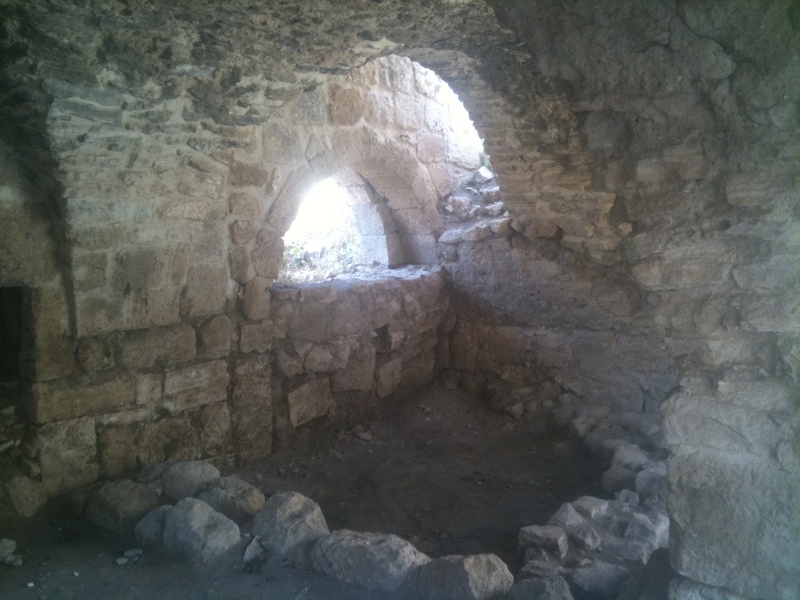 It is the ruins of this Crusader building that are still visible under the ground. The Mamelukes first, then the Ottomans turned the Crusader structures into a caravanserai, a roadside inn where travelers and their animals could rest and recover from the day’s journey. Tel Hannaton is called Tel Badawiyya in Arabic, from the Arabic word for Bedouin, nomad. 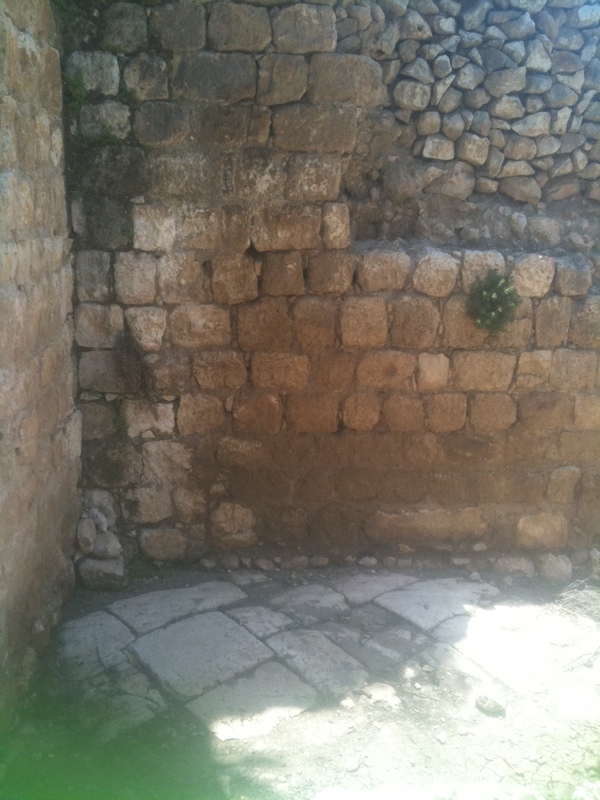 Tel Hannaton was partially excavated in the 1980’s but has remained untouched for many years. Today, school children on educational seminars at the Hannaton Educational Center visit and learn about the site, and it also gets visits from occasional curious families and hikers. But for me, its a constant companion, the ancient hill outside my front window. 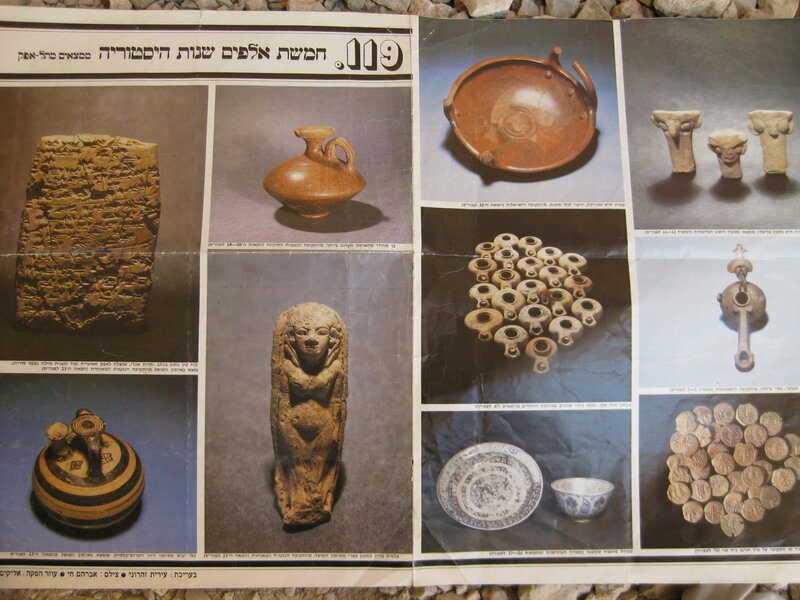 There is a law in Israel that states that when you start digging (to build a house, to clear a field, to fix a plumbing problem) and you come upon strange looking artifacts or stones (which happens VERY often), you must contact the Antiquities Authority immediately. They arrive and start a salvage archaeological dig… because you NEVER know what’s down there! The Crusades begin at the close of the 11th century, and the Christian armies plunder, loot, pillage and kill Jews in European villages along the way. They arrive in the Holy Land in 1099 with the intention of expelling the Muslim “infidels” out of Jerusalem and reclaim it for Christendom. They manage to conquer the city, massacre its inhabitants (Muslims and Jews alike) and thus begins the 1st Kingdom of Jerusalem, lasting almost one hundred years. As part of the Crusader effort to take control of the rest of the Holy Land, they start conquering other cities, laying siege to Acco on the Mediterranean Coast and taking it in 1104. Acco becomes their main sea port. The Knights Hospitaller and Knights Templar Orders build their headquarters in Jerusalem and establish small quarters in Acco, as well. On July 4th, 1187, the Muslim army under the command of Salah al-Din, massacre the Crusader army at Karnei Hittin and the Christians lose their foothold on the Holy Land. Four years later, Richard the Lionheart leads the 3rd Crusade back to the Holy Land and re-establishes them as the 2nd Kingdom of Jerusalem. However, they never regain Jerusalem from the Muslims and they must make do with Acco, which becomes their capital city and headquarters for the next one hundred years. The Knights Hospitaller and the Knights Templar rebuild their headquarters in Acco, and here is where our story gets interesting. 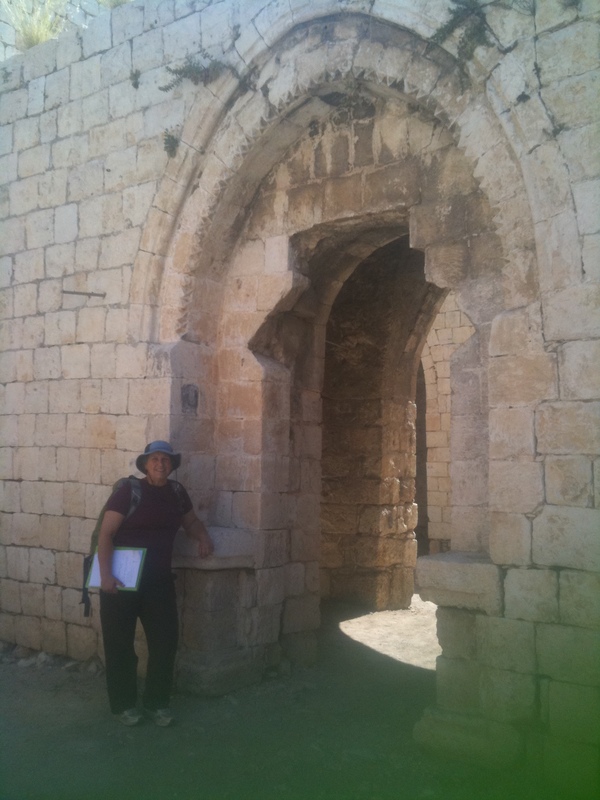 The Hospitallers build a massive, magnificent citadel in the northwestern corner of the city which travelers and pilgrims praise and describe in their journals. The citadel includes a hospital, a sugar storage facility, dormitories, dining halls and churches, all the necessary requirements to make life easier for the Christian pilgrim. In the end, the Mamluk Muslim army slowly drives the Crusaders out of the Holy Land and in 1291 allow the remnants to escape by sea from Acco. To insure that the Crusaders never return, the Mamluks begin a systematic destruction of all Crusader citadels and in the process leave the city of Acco in ruins. The magnificent city lays under rubble for over 400 years, until the arrival of Daher el-Omar (fascinating guy), who decides to rebuild it around 1750. He and his successor, Ahmed al Jazzar resolve, and rightly so, to rebuild on top of the ruins instead of first clearing the rubble. They choose to build their palaces right on top of the Knights Hopitaller remains. Look at the sketch above. 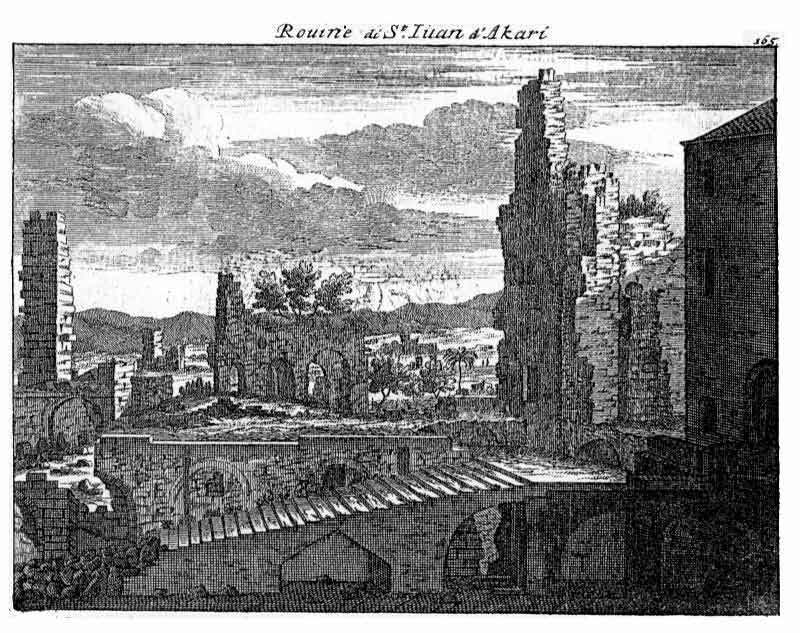 It was drawn by Dutch artist Cornelis de Bruijn, who traveled in the Holy Land in 1679 and sketched the Hospitaller citadel ruins. 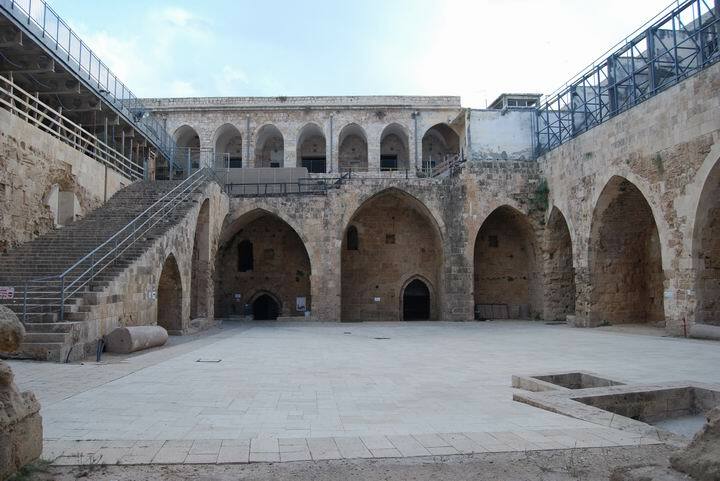 Notice the stairway and the arches underneath, and the second and third stories destroyed by the Mamluks. 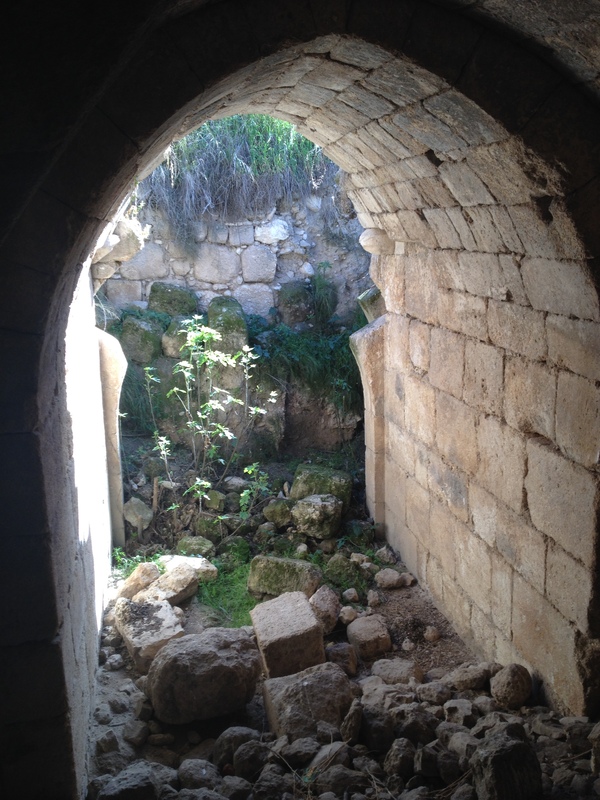 This is the ruin that Daher el-Omar and al Jazzar filled in and built their palace over. After the creation of the State of Israel, the prison area is turned into a museum, commemorating the imprisonment of many underground Jewish fighters and their daring escapes. In the late 1960’s, a tunnel was dug under one of the prison cells, a chamber where the visitor stood suspended on dirt and debris, almost able to touch the immense vaulted ceiling of what was believed to be the Hospitaller crypt, an underground burial site. 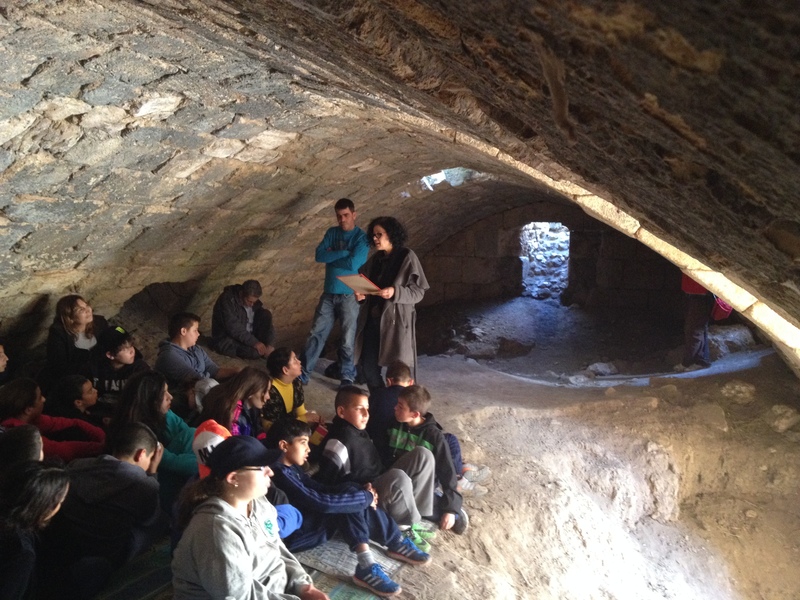 Many Israelis remember entering the dark, underground chamber as children on class field trips in the 1970’s and 80’s. Archaeologists and historians knew that there was SOMETHING down there, but what?!? 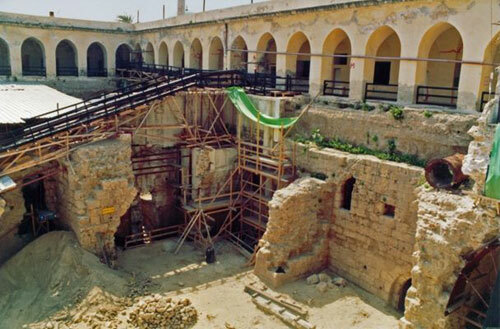 In 1992, the Antiquities Authority began the monumental task of excavating the Ottoman/British prison compound. Very slowly, the prison recreational yard, where prisoners relaxed, played soccer and plotted escapes for over a century was dug up. As the excavations progressed the archaeologists were becoming more and more puzzled by the finds. They uncovered a plethora of artifacts from the most unexpected historical eras; Early Bronze Age lying next to Crusader, Hellenistic and Persian! It didn’t make any sense. It took a while for the story to become clear, the reason as to why all this mishmash of artifacts was being uncovered under the prison compound. 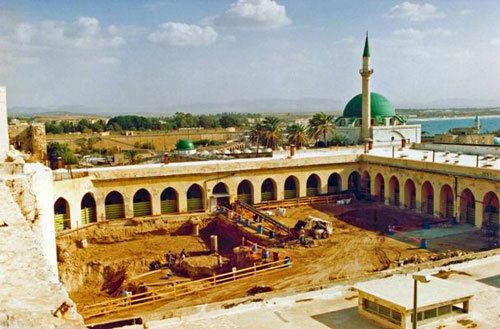 It turns out that in his effort to build the infrastructure for his city, Daher el-Omar in the 18th century decided to flatten out the area by filling it with dirt and debris so as to create a stable foundation for their buildings. And where did their workers haul tons of dirt from? 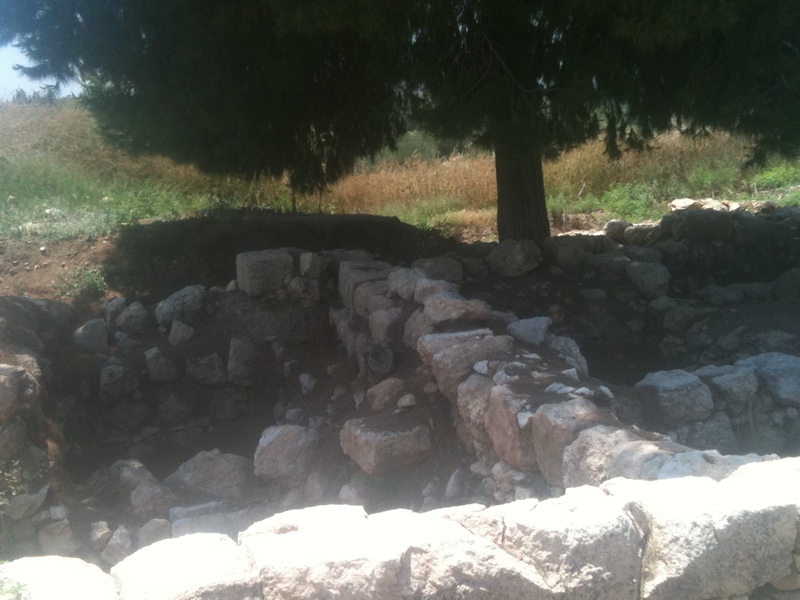 The nearby Tel Acco, of course, the hill where the urbanization of ancient Acco started almost 5,000 years ago! 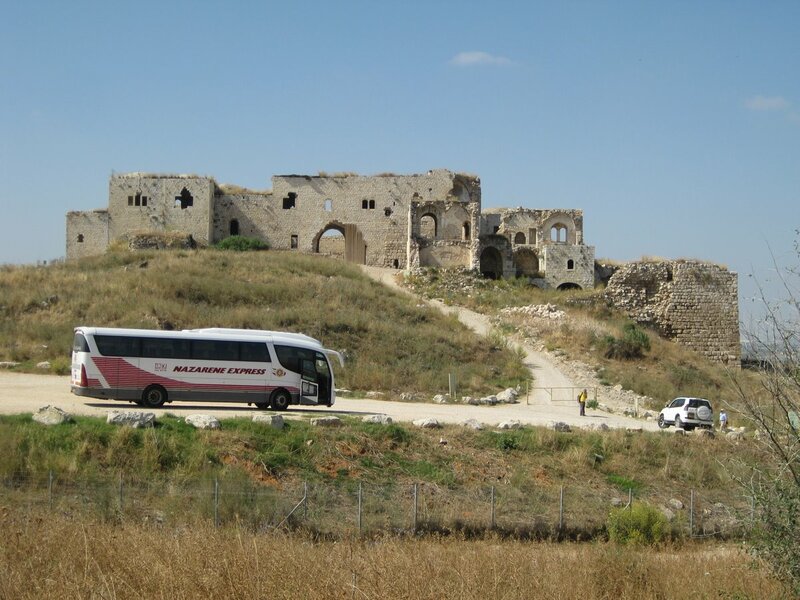 Ancient Acco began on a hill just a few kilometers to the east of the Crusader compound, where it remained throughout the Bronze Age, Iron Age, right through to the 4th century BCE. It was only then, during Persian and Greek times, that the inhabitants came down from the ‘tel’ and settled the small peninsula where the Old City sits today. As the excavations proceeded, archaeologists discovered they were right in the center of the Knights Hospitaller compound, in the courtyard as a matter of fact, with a well and water reservoir, public latrines, (remember the stairway from de Bruijn’s sketch above?) magnificent stairway to the second story and some of the most beautiful Crusader architecture ever found. Restoration and conservation work began in the early 2000’s and is still going on today. This is only one story from the Knights Hospitaller citadel compound. I haven’t even mentioned the magnificent Knights Halls, or the sugar production, or the crypt that turned out to be a refectory or the prison dungeon… and what about the Baha’is, the Rambam, the Ramban and the Ramchal, and Napoleon for goodness sake’s! And where does the name Acre come from, and the Turkish baths, and Zeev Jabotinsky, and why was Paul Newman (yes, the gorgeous one) here? There are so many more stories and places to see and enjoy. Come to Acco. Its fabulous. Do you know the way to… Jerusalem? Take for example, the road to Jerusalem. Jerusalem, spiritual and political capital of the Jewish people for over 3000 years, and a holy pilgrimage destination for Christians and Muslims for countless generations, is completely surrounded by mountains. 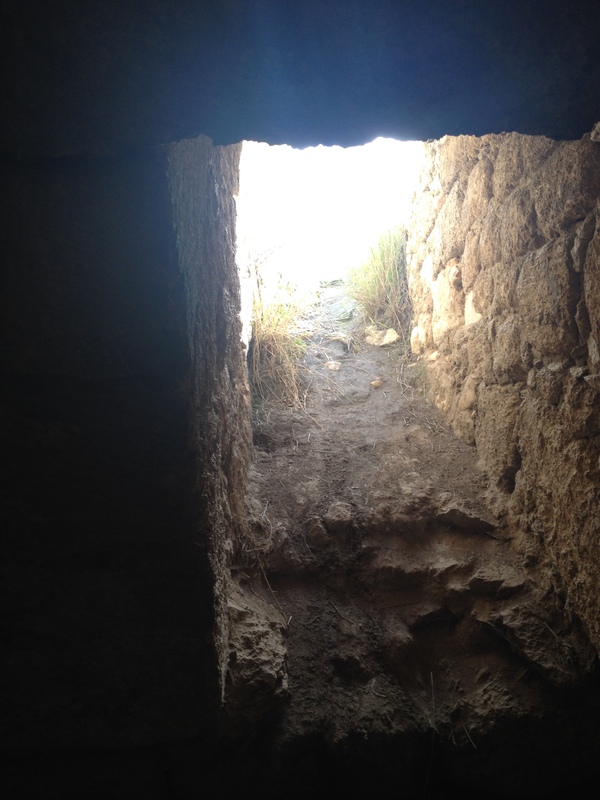 Trekking up to Jerusalem from the coastal plain has always been somewhat of a challenge. There were several ancient roads to the city traveled by Cannanites, Israelites, and Greeks. However, when the Romans, history’s champion road builders, conquered the land, they paved a main road from the city of Lydda (Lod) to Jerusalem. This Roman road was built along a mountain ridge line, thus maintaining a relatively stable grade up to the city. Today’s Highway 443 follows this ancient Roman road, a comfortable, divided four-lane highway up the Beit Horon grade, past the city of Modi’in and into Jerusalem. Nice and easy. “What’s the problem?”, you ask. Well, the problem is that even though Hwy 443 is easier, shorter and a more comfortable climb to the holy city, it is not the main thoroughfare, not the main entrance to Jerusalem. Huh? I know, I know. Strange twists in history. There was another ancient path on the southern border of the Ayalon Valley, through the narrow Bab al Wad mountain pass, up a mountain, down a valley, twisting and turning in gullies on its route from the coastal plain through the hills, up and down a few more times and into Jerusalem. It is a longer road, a very strenuous ride for donkeys, camels and the travelers who rode on them. It all has to do with a small, controversial detail in an important story from the Gospel of Luke, 24:13-35. It tells of two men and their meeting with Jesus, exactly two days after his resurrection. “That day two of them were going to a village named Emmaus, about a hundred and sixty stadia from Jerusalem…”. Jesus joins them on their walk but does not reveal his identity, accompanies them to Emmaus, where they eat and break bread together, chat and then go their separate ways. It is only after Jesus’ departure that the two men realize the true identity of the stranger who ate with them. They then go tell the disciples that they had seen Jesus in the flesh. The disciples realize that rumors of Jesus’ resurrection had been confirmed and he had risen. Very important story. Jesus breaking bread with the two travelers at Emmaus. However, where is Emmaus? Well, that’s complicated. Some earlier versions of Luke say “160 stadia”, (a Roman stadium being about 600 ft), and therefore 160×600 ft is about 7.5 miles, putting the event right next to Bab el Wad, the aforementioned narrow passageway on the longer, more challenging route to Jerusalem. Great! 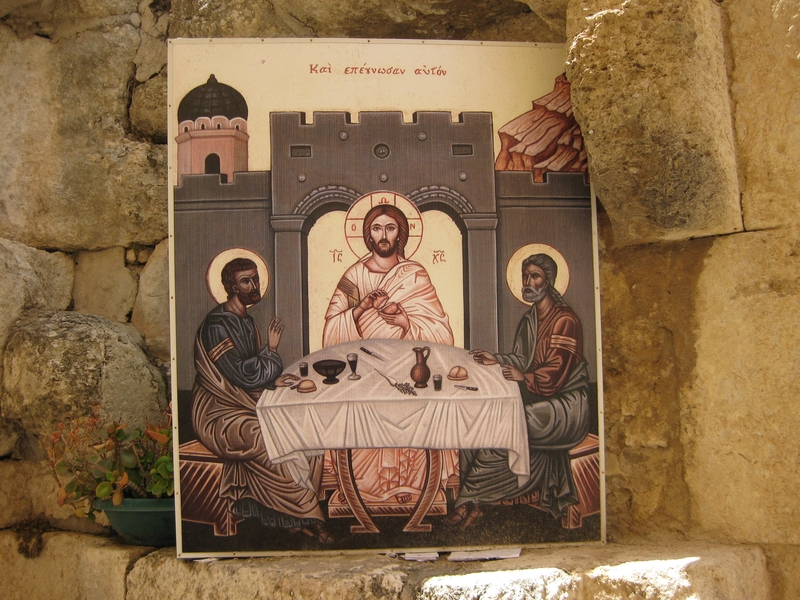 This site was chosen as the Emmaus of Luke. As the Christian Byzantine Empire took control of the Holy Land (4th century ce), so began the tradition of Christian pilgrimage to Jesus’ homeland and the sites made holy by his actions and sermons. Christian Pilgrim: Hello my friend, I’ve just arrived by boat from Anatolia. I need a donkey to get me to Jerusalem. Donkey rental attendant: Sure, no problem. This fine donkey will do, he’s made the trip several times and knows it by heart. Christian Pilgrim: Great! Will he take me by Emmaus, where my Lord Jesus appeared after his Resurrection? Donkey rental attendant: Well, actually no, this donkey much prefers the easier route, less time, less hills, less problems. Christian Pilgrim: What!? Are you kidding me? I have not come all this way to make it easy on myself or the donkey. How can I show my face back in the village if I don’t visit Emmaus? I’ll be taking the long and winding road, thank you very much! Donkey rental attendant: (sigh) Suit yourself. Why the long and winding road?!? Why? In later versions of Luke 24:13, the distance from Jerusalem was changed to ’60 stadia’ (scholars don’t know why, misprint?) and latter pilgrims placed the event at a different location altogether. Just to be sure, the Crusaders built several citadels on this road to Jerusalem, at Latrun (from the French Le toron des Chevaliers), at Abu Gosh, and at Aquabella (Ein Hemed). Through the ages, Christian pilgrims also declared and visited the villages of Motza and Kubebah as the “Emmaus” of the New Testament, all on this same road to Jerusalem. So which is the real Emmaus? It’s all a matter of faith, ladies and gentlemen. First the Christian Byzantine pilgrims, then Arab Caliphates, Ottomans, British and even present-day Israelis still use this road as the main drag into town. Today, the government of Israel tries to dissuade commuters from taking Hwy 1, it is often congested, more dangerous and causes great traffic jams at the entrance to the city. Trucks are not allowed on it in the mornings anymore, big signs recommend switching to Hwy 443 or other newer roads, but many of us still prefer this winding road into the city. p.s. There is, of course, more to this story, having to do with the Green Line, the Ottomans, the Palestinians, the paving of 1869, today’s political climate, etc. Great conversation over a cup of coffee. As we leave Migdal Tsedek Fortress behind, and move across the narrow Afek Pass, about 2 km wide, we reach the next fortress on our journey. The Afek Pass, this particular point on the Via Maris (the Way of the Sea) was historically swampy and created serious problems for those armies traveling from Egypt to Mesopotamia. On the other hand, it was great for the defenders and one can clearly see the advantage of controlling a fort on either side of the pass. Tel Afek is first mentioned in the Egyptian Execration texts (c. 1900 bce), when this was a fortified city with palaces. Later, it became a royal Canaanite City and is mentioned in the writings of Thutmoses III, who actually rode his chariot by on his way to attack Meggido! The remnants of the local Egyptian governor’s palace have been partially excavated and are evidence of Egyptian rule. The most important archeological finds found here are the clay tablets, inscribed in different languages, Sumerian, Akkadian, Canaanite. What a crossroads this place was! The Greeks, Romans, Byzantines, then the Umayyads and the Crusaders, all had a hand in creating Tel Afek’s history. And then the Ottomans built a large fortress as well. Oh, and the British built ‘pillbox’ guard towers here to protect the railroad bridges. What I found most interesting was the close relationship Tel Afek’s historic names have had with the natural surroundings. Water! The waters of the Yarkon River emerge here and slowly meander 28 km to the Mediterranean Sea, creating the historically important swamps mentioned above. Afekum = river bed, comes from the Akkadian (Mesopotamia), the international language of those days. Afik = river bed in Hebrew as well. 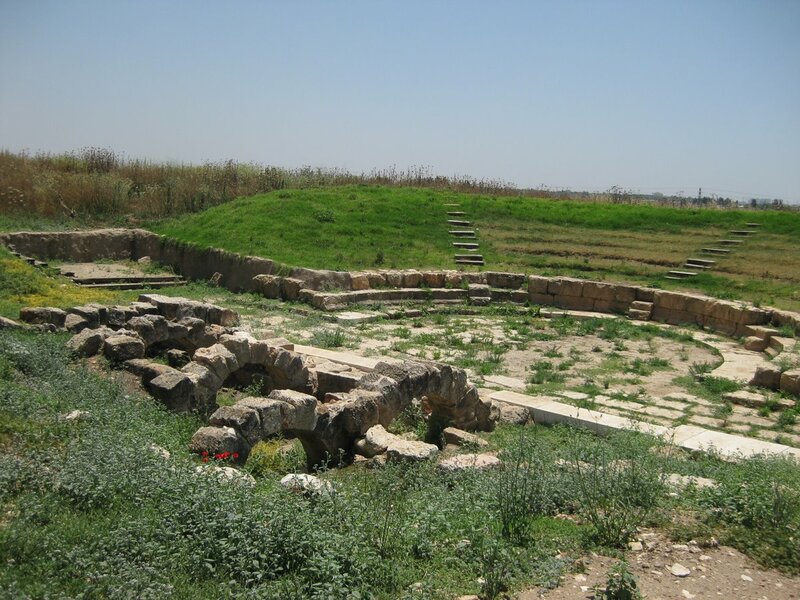 Later, during the Hellenistic period, the city was named Pagae (Springs in Greek). When the Ottomans arrive, they name the place Pinar Bashi (head of the springs in Turkish) and that name was eventually changed to Binar Bashi by the Arab speakers of the area. (Remember that Arabs have no /p/ and change it to /b/). In more recent times, a town called Ras el Ayin (head of the springs, Arabic), sprung up 🙂 and eventually the Jewish city of Rosh HaAyin (head of the springs, duh! in Hebrew) was built. The only exception to this water theme was, of course, our dear friend Herod the Great, who went and built a Roman town on the ruins of the Greek Pagae, and named it Antipatris, in honor of his father. Go figure. The Ottoman fortress sits on top of the cardo (the north/south main axis street of the Roman town) and one can walk the same path, touch the same paving stones, as Romans did 2000 years ago. Can you beat that? Not only that, but the stores that lined the cardo and made up the Roman downtown shopping district are also visible and there is a lovely, little odeon (small, intimate theater) nearby. Go shopping downtown, then to the theater… nice. Can’t you just see a pair of young lovers spending a romantic night out on the Antipatris? “Wow, the view from here is absolutely fantastic!” was my first thought, and then I entered the white fortress and smiled to myself as I realized this is a perfect place for kids to explore. Oh yeah, you gotta bring the kids! 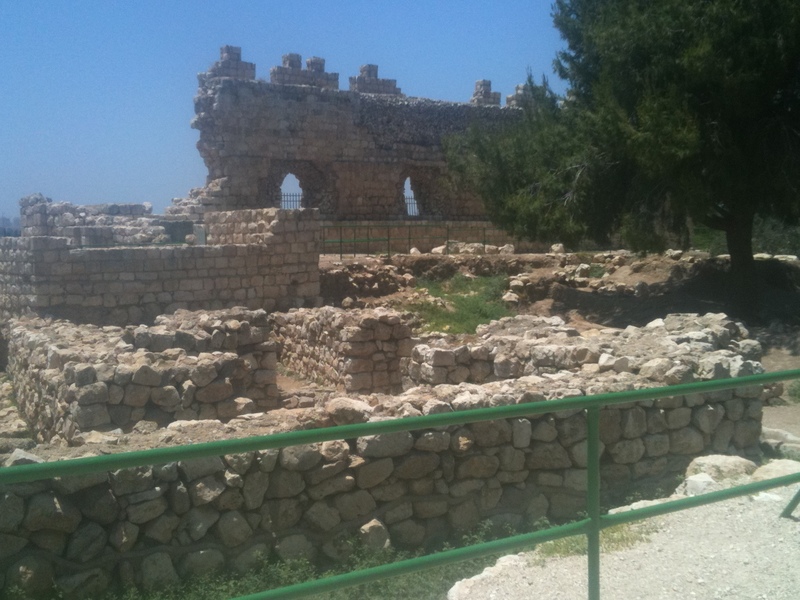 As part of our study about water sources in Israel, we came to the Sharon region, a division of the Coastal Plateau and as it turns out, home to some awesome fortresses! Migdal Tsedek is a fortress on a hill overlooking the ancient Via Maris (the Way of the Sea), the road which led from Cairo in Egypt to Damascus in Syria. Anyone who was anybody in the Ancient World and wanted to conquer this land came through here; Philistines, Egyptians, Greeks, Romans, Byzantines, Crusaders, Ottomans, the British, you name them, they were here. Thutmose III, Pharaoh of Egypt (1479 to 1425 bce), rode by here on his chariot on his way to attack the city of Meggido! The road in the background is Hwy 6, a modern highway built along the ancient Via Maris. 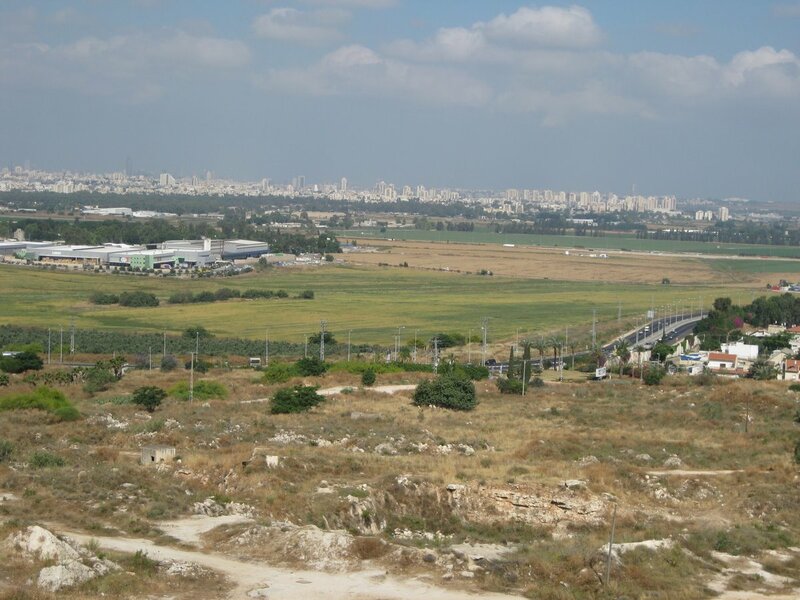 The cities on the horizon are Petah Tikva, then Ramat Gan and eventually Tel Aviv. It was a beautiful day and we were even able to see the high rise buildings along the Mediterranean shore, 14 km away. 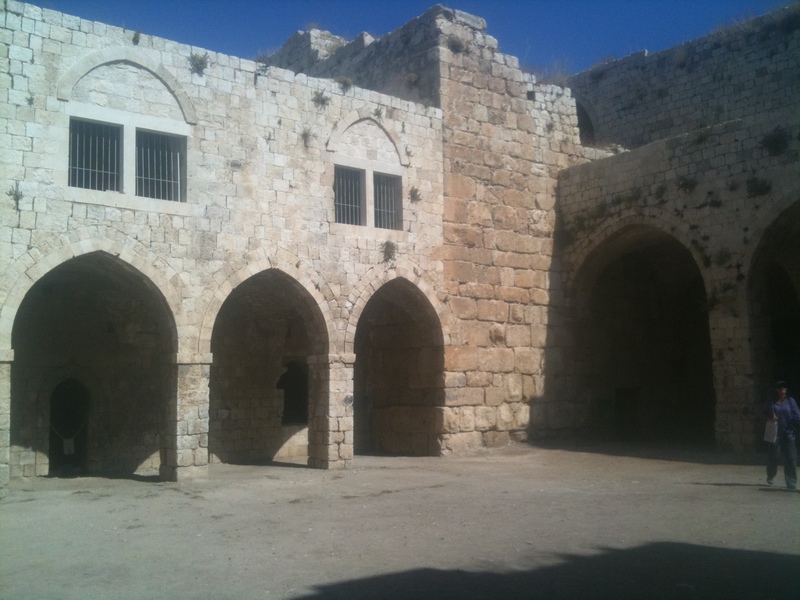 The present citadel was built by the Crusaders and named Mirabel, and it exemplifies classic Crusader architecture, 4 large walls, large inner patio and beautiful arches. When the Ottomans took it over, they rehabbed with smaller stones, added some rooms and a bit of flurry to their arches. I enjoyed climbing the staircases, exploring small rooms with arched windows, taking in the view from every possible angle. This newly refurbished citadel is a delight!